The Dalmadoodle is a Dalmatian Poodle mix. These dogs are becoming increasingly popular in the last few years. This Dalmatian mix is known for being intelligent and loving. Many people are interested in them as companion dogs. But, not everything with these dogs is as it appears. While they can make excellent family dogs, they also have some unique requirements and suffer from quite a few health problems. To help you make an informed decision, we’ll cover everything you might need to know about this Dalmatian cross Poodle. Where Does the Dalmadoodle Come From? Like many of today’s popular mixed breed dogs, we don’t know who started breeding Dalmatian Poodle mix dogs first, or why they made that decision. But we can get to know a bit about what they’ll be like by looking at the history of their parents. The Dalmatian has existed since the 18th century. But it did not become popular until the Regency period when they became a status symbol. This breed was bred to work with horses. They were designed to trot next to horse-drawn carriages, and they even guarded the stable at night. Horses pulled the first fire engines. So, this dog was employed to help keep the horses calm near fires. Dalmatians were also dogs of war. These dogs guarded the borders of Dalmatia (now part of Croatia). They were also occasionally used for exterminating rats and other vermin. The Poodle has a very different origin story. They descend from the French Barbet, another breed of dog. The Poodle was trained to retrieve waterfowl thanks to their fantastic swimming abilities. There is some controversy over which country the Poodle originated in. Both Germany and France recognize the breed as originating from France. But the British, American, and Canadian Kennel Clubs state that the dog originated from Germany. The Dalmadoodle is a cross between these two dogs. Deliberate crosses between two specifically chosen pedigrees are sometimes known as designer dogs. They are usually an attempt to harness the best qualities of both breeds, but in reality the outcome is far less predictable than that. Mixed breed dogs can inherit any combination of traits from their parents. For people who prefer purebred dogs, this uncertainty is undesirable. They also worry that too many mixed breed dogs are being raised in puppy farms. On the other hand, mixed breeding expands the genepool of hybrid pups, which generally has a positive impact on their health and lifespan. This is thanks to a process called hybrid vigor. You can read more about the purebred vs. mutt debate here. The Poodle Dalmatian mix can vary quite a bit in appearance. This canine may or may not develop the spots of the Dalmatian. Many puppies tend to have larger spots than the Dalmatian parent – more like splodges. But others don’t have any spots at all. Their fur can be short like the Dalmatian’s or longer like the Poodle’s. Depending on the length, you might need to groom these dogs often. They are athletically built. Both of these breeds were originally bred to work. So, this crossbreed will be built for endurance and working. Their weight can range from 40 – 70 pounds. And, they usually stand at 20-22 inches. The Dalmadoodle is known for its gentle nature. Neither parent is particularly aggressive. These Poodle cross Dalmatians are playful and usually have very high endurance. Initially, people partnered with these dogs for long days of work. And this endurance will carry over to this mixed breed. The Dalmadoodle can be very intelligent depending on the exact genes they inherit. They can also be somewhat stubborn though, and this stubbornness can make training difficult. They are very loyal and people-focused. And will likely benefit from lots of praise and interaction. However, they can also have guarding instincts. These instincts can make them unsure of strangers and prone to barking. Luckily though, these problems are usually not severe. 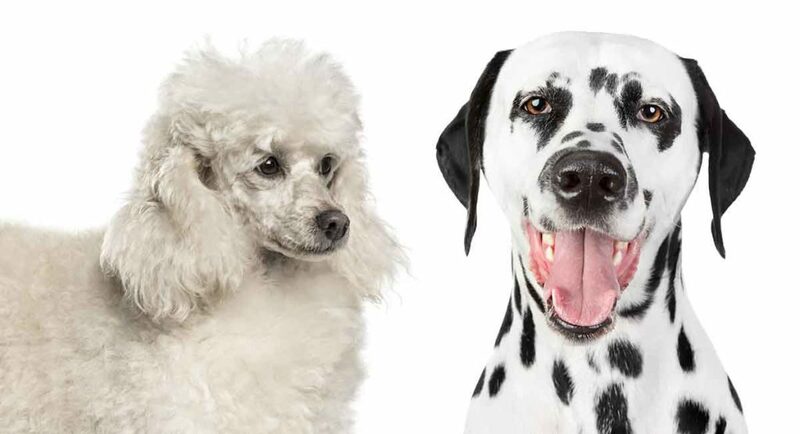 Depending on the exact traits inherited, the Dalmatian and Poodle mix has a variety of grooming requirements. For dogs with more Dalmatian-like coats, grooming does not need to go further than weekly brushing. These dogs will shed, so a good brush will prevent the hair from covering your house. But, if your pooch as longer hair, they will likely need to be brushed more often. The longer the hair, the more likely it is to become matted. Regular brushing is essential to keep your dog’s coat tangle-free and healthy. This brushing is also a good time to check for cuts or infections. These injuries tend to hide underneath a dog’s long coat and can go undetected if you do not pay attention while grooming your dog. If your dog’s coat is more Poodle-like in texture, specialized grooming appointments will be needed to strip and trim their coat. This type of grooming requires specialized skills and must be done by a professional who has experience with Poodles. Luckily, this dog’s people-pleasing nature usually make grooming sessions easy when done regularly. Lots of people with allergies are interested in Poodle crosses because they’ve heard that their non-shedding coat is hypoallergenic. Unfortunately this is incorrect on two counts. Firstly, the Dalmadoodle’s coat is not guaranteed to be non-shedding. And secondly, sadly there is no such thing as a hypoallergenic dog. The Dalmatian Poodle cross is prone to a few health problems that you should keep in mind. One of the most common of these is hip dysplasia. This disease is common among nearly every large dog, even mixed breeds. Before you approach Dalmadoodle breeders, find out more about hip scores, and then look for puppies who’s parents have healthy hip scores. Addison’s Disease is also common. This disease is characterized by an inadequate creation of hormones from the adrenal cortex. This causes progressive anemia. These mixed breeds can also inherit Cushing’s Disease from their Poodle parent. This disease is caused when too much cortisol is produced in the body. Overproduction of cortisol can cause all sorts of problems throughout the body, including hair loss, lack of energy, bruising, and muscle weakness. Urinary stones are also common. These must usually be removed through surgery. Deafness is extremely common in Dalmatians. Nearly 29.7% of Dalmatians have a hearing disorder of some sort. This mixed breed can inherit deafness from their Dalmatian parent. These dogs are usually very intelligent and catch onto commands quickly. However, they can also be stubborn and require much praise and prompting. They can have medium to high exercise requirements depending on their age. Plan on at least walking this dog a couple of times a day. A fenced-in backyard can be very helpful in helping this canine get the exercise they need. On top of physical exercise, these dogs also require mental stimulation. The more intelligent they are, the higher their need to put their brain to use will be. Is the Dalmadoodle a Good Family Dog? The Dalmadoodle can make a great family dog for the right family. This dog is not built for apartment living – they require a lot of exercise to be happy and healthy. They also require a lot of time to train and exercise properly. Dalmadoodles need to be mentally and physically stimulated at least once a day. Without these training sessions, they can become bored, destructive, and aggressive. But they are usually good with children. This breed’s working nature means they have the endurance to play plenty with the kids. If you decide that this dog is for you, your next step is to find a healthy puppy. We recommend adopting from an ethical breeder. While they can be more expensive, they are also more likely to sell you a good, healthy family dog. A good breeder will test their puppies’ parents for hereditary illnesses before breeding them together. This should particularly include hip and eyesight testing. Running these tests helps ensure that neither parent will pass on these disorders to their puppy. In other words, they help make sure that your puppy is genetically healthy. You should also be able to check on the temperament and health of the parents before adopting your puppy. This will give you a view of how your puppy might act in the future. You might even be able to ask about the puppy’s grandparents. If the puppy’s grandparents are no longer living, we recommend asking how and at what age they passed away. This can give you a clue to the health of the bloodline and what diseases your puppy might be prone to. Is the Dalmadoodle Right for Me? The Dalmadoodle can make a good family dog in the right home. They require quite a bit of time, but they are also friendly and intelligent. Remember though: this breed is a hybrid. So, there is quite a bit of unpredictability involved. Strain, George. “Brainstem Auditory‐Evoked Potential Assessment of Congenital Deafness in Dalmatians: Associations With Phenotypic Markers.” Journal of Veterinary Internal Medicine. 1992. Hesse. “Canine urolithiasis: epidemiology and analysis of urinary calculi.” Journal of Small Animal Practice. 1990. Castillo, V.A. “Cushing’s disease in dogs: Cabergoline treatment.” Research in Veterinary Science. 2008. Pedersen, Niels. “The effect of genetic bottlenecks and inbreeding on the incidence of two major autoimmune diseases in standard poodles, sebaceous adenitis and Addison’s disease.” Canine Genetics and Epidemiology. 2015. Rettenmaier, J.L. “PREVALENCE OF CANINE HIP DYSPLASIA IN A VETERINARY TEACHING HOSPITAL POPULATION.” Veterinary Radiology & Ultrasound. 2005. Stafford, K.J. “Opinions of veterinarians regarding aggression in different breeds of dogs.” New Zealand Veterinary Journal. 1996.